Rnd. 01: Sl st into ring, ch 3, 9 dc in ring, sc, *( ch 3, 3 dc, sc )* repeat 14 times, from * to *, sl st in 3rd ch of beg. ch 3 to join. Ch 2 turn. Rnd. 02: * (dc in next 9 dc, ch 2 turn). * repeat from * to * 5 times Ch 2 turn. Rnd. 08: Skip next dc, in next dc work 2 dc, trc, 2 dc, skip next dc, ch 2, sl st in top st of round 7 . Sew on button, slip between dc sts to close on any row of your choice. 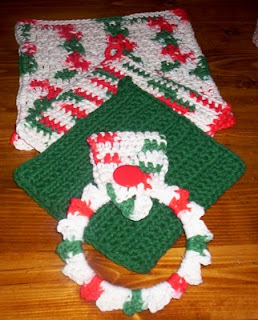 Dish Towel and Pot Holder patterns are below in another post. I love this .. thank you for the instructions! 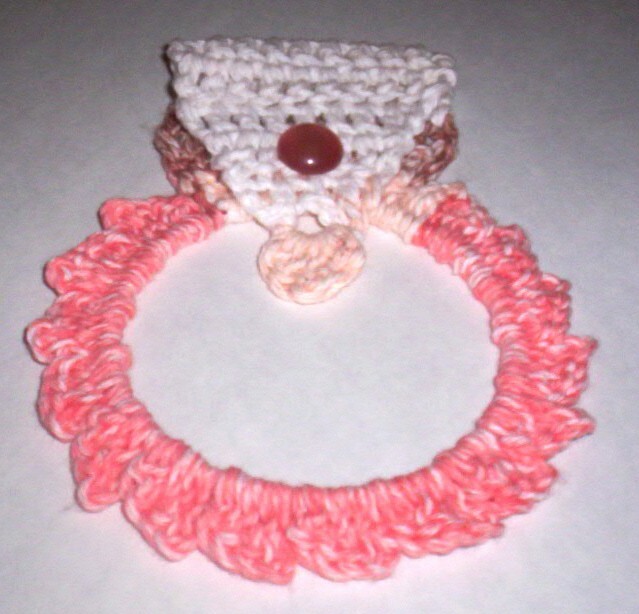 Thank you Heather, I see those dishcloth of yours are featured at the daily Crocheter today. Congratulations.